As I saw the full moon rise last week, I tilted back my head and sighed into the night sky. Two full moons have come and gone since I cried in the moonlight that evening my Mom said her last, “I love you.”Weeks have passed and I have had no time, no energy, to write about this gorgeous day in which we laid her body into the earth. To grieve in this modern world is not easy. We don’t dress in black, we wear no black arm band. We carry with us no symbol that says we are walking through sorrow. Our break-neck pace leaves no room for our break-heart needs. It shoves us forward, onto the next thing, the next event, the next responsibility, with no thought that maybe, we can’t. Maybe we can’t do what we did in our unbroken state. But we tell ourselves we have no choice. We put on our “I’m alright” face and stuff our tears deep. School let out the day after the funeral and I have not stopped. I have not been able to really reflect on all that happened, to grieve, or even recover. All my thank you notes sit unwritten. Emails go unanswered. And I just keep tending to the immediate. Death is traumatic. I see that now, as scenes from my Mom’s death play out in my dreams. There are feelings and places I will need to work through. I am exhausted every day and wish I could find a quiet mountain or beach somewhere to just be. To think, cry, remember, process, and sleep. But if I want to grieve, I must give myself that time. No one else will hand it to me. And the challenge is that I’m no sovereign. I am a mother, landlocked by five dependent children, who are my home. They need me. And when I stop to consider it, I need them. They are good for my heart. Even if summer throws us thick into each other. And most days I can’t catch my breath. Maybe in September I will regroup, reflect, and recover. May 25th was a beautiful day. The temperature was perfect, the sunlight soft, and each person who came added so much to what we saw and felt. If you were there at any of the services or viewings, may I humbly say, thank you. You carried us, you lightened our hearts, you held out your arms to us. And you truly mourned with us. I have never experienced such powerful comfort and compassion through others. The viewings were crowded with dear friends and family. And the funeral services were healing. My Dad asked Lauren to play at the funeral. When she came to play for my Mom, she introduced us to a new song which we all loved, but my Dad loved it best. It was Into the West, by Annie Lennox. Lauren played with great feeling and tenderness. I sat next to my Dad and held his hand. We wept through the entire song. The words were included in the program so everyone could read along. Below is a recording of Lauren playing Into the West. I wanted you to hear the melody. Read the words as you listen. Every phrase is so rending but peaceful. It describes perfectly our experience of letting Mom go. Watching the ships come for her, claim her, and gently guide her away from our shore. The grandkids sang one of my Mom’s favorite children’s song, In the Leafy Treetops. We wrote a third verse for Mom, which we also included on the program. 1. In the leafy treetops, the birds sing good morning. They’re first to see the sun, they must tell everyone. In the leafy treetops, the birds sing good morning. 2. In my pretty garden, the flowers are nodding. How do you do, they say, how do you do today? In my pretty garden, the flowers are nodding. 3. In our happy family, we’re thankful for Grandma. She’s first to see The Son, we must tell everyone. Every happy family can last forever. Mixed in between the musical numbers were our remarks. My Dad asked each of his children to speak. Worried we would be redundant, we each chose just one of Mom’s attributes to talk about. Rachel take doubt my Mom’s service and obedient heart. Sarah talked about her garden and love of nature, birds, and the outdoors. Becca talked about her record keeping, how she kept a wonderful history of our family, as well as family history for her parents and ancestors. Deb talked about her sense of humor. Dave talked about her work ethic and how she taught us to work hard. And I spoke about her faith. I wish I could include all of the remarks here. But it would be lengthy. So I will just share with you, what I said about her faith. Over 22 years ago when she was first diagnosed with a brain tumor, I was 20, Rachel was only 10. I was in Israel, Dave was in Brazil on his mission, and Deb became surrogate mother to our younger sisters. I remember Mom’s voice on the phone in my room at the Jerusalem Center. “I am going to be alright,” she said. And I believed her. I did as she told me. I stayed in Israel and turned to my Savior for comfort and understanding. After her first two surgeries, the tumor was miraculously removed. We cherished the many extra years we had with our Mom. She taught us then that faith could work miracles. But after the tumor returned and we gradually watched her lose function, we learned from her that true faith is more than expecting a miracle. It is submission. It is not turning your back on God when you have to walk a road you would not choose for yourself. It is trusting Him when your prayers or desires seem to go unheard. She did this. She submitted herself. With grace, humility, and with unfaltering love for her Savior. During her miracle years, as we call them, she felt the need to do something important. But she wasn’t sure what. She never served that mission with my Dad. But she did make us something we will always treasure. It’s a book of the stories of Jesus. She spent her time writing down each of the stories of Jesus in her own words. With pictures, scripture, and her testimony. All of her posterity can have no doubt where she got her strength. And in whom she trusted. These last two years, even in the middle of heartbreaking decline, she showed us again, what it means to have faith. She never complained when she was trying to learn how to walk again; she worked so hard. She never complained when we had to lift her paralytic arm for her, when we had to heave her on and off the toilet, when we had to feed her, roll her, change her diaper, brush her teeth. Not once did she complain. Mostly, she laughed with us and said thank you. And when I would say, “Mom, it’s time to pluck your nose hairs, and your chin hairs,” I’d get going with the tweezers and have to push her face into awkward positions and we’d start laughing so hard we’d be crying. Crying for the laughter. Or maybe crying because plucking nose hairs hurts so much! She took it all like a champ. On Tuesday evening we gathered as siblings to spend some time with Mom and thank her for all she had done for us. Her eyes were closed and she didn’t speak, but we knew she could hear us. These are some of the last words we heard her speak. It took faith for her to say that. It took believing that some special angel would come to take her hand. That there would be a place of joy for her beyond that bed in the family room. And that the pain of separation we would feel would not last forever. The hole carved out in each of our hearts as she took her last breath will not go away anytime soon. But it will be a holding place, that will fill with joy when we are reunited with her. Mom passed her faith on to us. And just like her, we hold on to Christ and His promises. These words from Isaiah capture well what we believe, and what she now knows. How I love you Mom. After arriving at the cemetery, my Mom’s brother Berkley dedicated the grave. It was a beautiful prayer. He made mention that it would be a place of peace. That the birds would always sing there. That we could go there and remember, and feel Ronda. He blessed this spot to protect her body until the resurrection when she will walk into my Dad’s arms once more. This was the first time I had seen all her siblings together, without her. 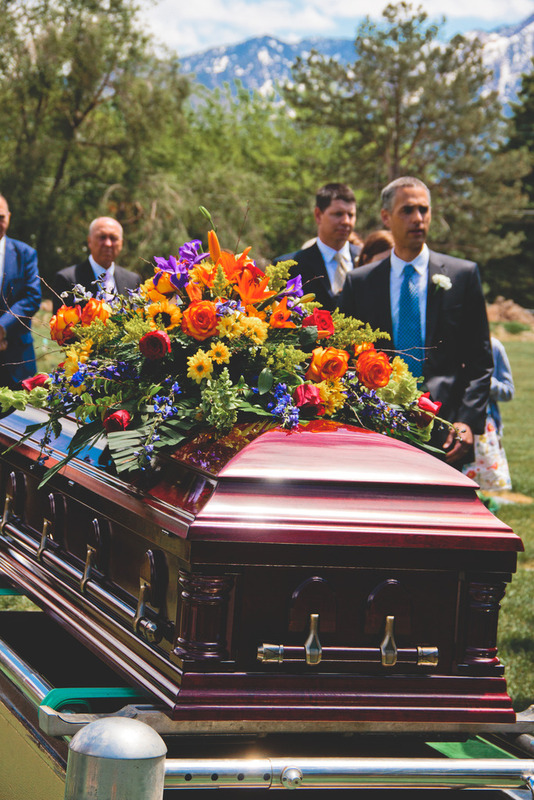 The pallbearers were asked to lay their boutonnieres on the casket. Here is Spencer placing his white carnation atop our spray of garden flowers. A sweet childhood friend of mine, Kristi, brought me this gorgeous lei. She knew someone who could ship it from Hawaii, rush order, so it would be fresh and on time. It is a funeral lei. Because plumeria blossoms come from the ground, and before the casket is interred, you place them on the casket to return to the ground. It smelled of heaven and I wore it when I spoke. Such beautiful symbolism. This was extremely tender for me. Isn’t the casket beautiful? Its mahogany wood caught the light with such radiance that day. The same radiance that seemed to grace my Mother when she was alive. And then my Dad stood to speak. His heart so broken. Crushed in a way I cannot understand. And he smiled. Just like you see below. He spoke only a few words. He told everyone how much he loved them. He said thank you. Then asked that everyone take a flower from the arrangements to keep at home and remind them of his sweetheart, Ronda. That smile says so much. It never goes away for long. It is an underline of happiness on which his world turns. Somehow, he has figured out how to praise God in his suffering. Look at the love in his eyes. Love for everyone holding him up. Love for the sunshine he claims so easily. And love for the God he knows will bring his wife to him again. I have always adored my Dad. But the last couple years I have found an admiration and love for him for which I cannot find adequate words. There were so many flowers. So many tributes. My Mom would have been overwhelmed by this outpouring of blossoms. Even little Jack made time to smell (or maybe eat?) the daisies. The grandkids chose their flowers. Little Emma picked a rose. She brought my Mom so much joy those last few weeks. My Doug, whom I can’t even think of losing. Dave, Shirlee, Maya and Ethen. It was so good to finally have Dave with us. Rachel. She gave so much to Mom. So very much. Our Keddington and Kimball family. A perfect place to lay our sweet Mom down. Over the next few days we cherished her body. It was an honor to go with my Dad and my sisters to dress Mom before the viewing. She looked so pretty. Deb touched up her hair and makeup. And when they eventually closed the casket prior to the service, Liza tucked a little note into the casket only she and Grandma knew about, Rachel tied a white veil under Mom’s chin then covered her face, I held onto my Dad’s arm, and we sobbed. Even separating from her body was difficult. Everyone hugged and spoke quietly in this sacred spot below Mom’s mountain. Then slowly, they walked away and climbed into their cars. But I lingered. And as I watched them leave, a phrase came into my mind. “Everything is as it should be.” And I knew that revelation to be true. It didn’t lessen the ache or the longing for my Mom, but it did bring peace. We had so many years with her that were a gift. She knew it. And we knew it. God had extended her life. He let us have her as long as He possibly could. Until it was her time to go. And when it was, she did not fight it or resist. She did just as she said she would. She left. It seems no coincidence that my Mom is buried right next to Kara’s grandfather, Duff Hanks. Marion D. Hanks. Sweet Grandpa Hanks, as I called him. He married me and Doug in the Salt Lake Temple. I have written about him before. Kara knows loss. And she knows that God is in it. I am so grateful she could walk this journey with me. I love these words from a song, written by my friend Elizabeth, who lost her Dad not too long ago. I do feel Mom’s presence. I go to her house and she is there. I work in her garden and she is in the dirt, the air, in her flowers and plants. I see her everywhere. And I know, she comes to us often. I know she is with us. And I know that Into the West simply means she has shifted dimensions. Just because I do not see her, does not mean she is not there. I have heard you whispering Mom. I have felt you. I love you. Cath, I have no words, only love and tears. What a beautiful way to celebrate your mom's life. This is beautiful. Thank you for recording this. My dear friend, this is such a beautiful tribute to your amazing mom and all who love her so much. Her faith and her belief in God, His will, His timing, and His miracles is absolutely incredible. I have been so inspired by her life. "Into the West" has long been one of our very favorite songs. Now it will hold an even more special place in my heart. How you love your mom! Her love and goodness will continue on and on. I'm so sorry for your loss. Thank you for sharing your testimony with us – it has helped me very much today.